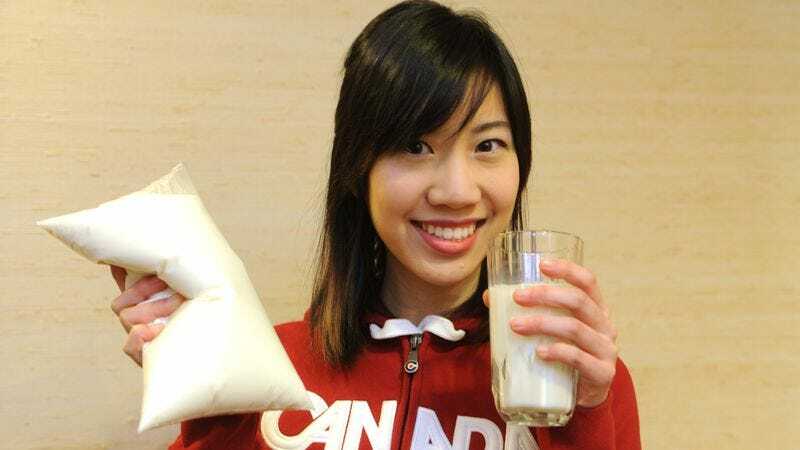 Why does Canadian milk come in plastic bags? Consider the billions of plastic jugs, paper cartons, and glass bottles needed to house milk each year. Now consider a vessel that takes up a fraction of the space and is, undeniably, more environmentally sound. It can be a strange sight for the unfamiliar, and yet it makes so much sense: bagged milk. It’s a concept foreign to most Americans, but in the Canadian province of Ontario (Canada’s largest by population), an estimated 75 to 80 percent of milk comes in plastic bags. Outside Ontario and Quebec, you’ll also find bagged milk in Uruguay, Colombia, Brazil, Russia, Argentina, Hungary, South Africa, and India. Here’s how it works: You head to a supermarket and pick up a plastic sack, which contains within it three small pouches of milk, totaling roughly one gallon. You place one of these pouches in an open-top pitcher, snip off a corner of the pouch, and pour milk as needed. By the 1960s, consumers slowly began to shift away from glass-bottled milk in favor of jugs and cartons. The reasons were apparent—delivering milk in glass bottles was inefficient and expensive, plus bottles were difficult to transport without breaking. Paper milk cartons had been around in the U.S. since 1915 and had begun to gain traction. The same shift in milk vessel was happening north of the border. In 1967, DuPont introduced plastic bags that could be injected with milk. But its popularity in Canada would skyrocket in 1970 for one reason: the country’s conversion from imperial to the metric system. Jug and carton manufacturers—along with most of Canada’s manufacturing industries—faced challenges in converting to the new system. By comparison, plastic bags were easy to modify, and the country’s quick adoption of the metric system helped spur bagged milk’s popularity, and it soon became the market leader. The biggest complaint about bagged milk is it can’t be resealed; however, with the three-pouch system, you end up exposing smaller quantities of fresh milk to air at a time. But the advantages are considerable. The bags use less plastic, making them cheaper to produce and easier to store in the fridge, as they’re stackable and take up less space. They also make freezing milk more practical. Ardent supporters of the milk bag were inspired to dedicate websites and YouTube videos to proselytize their preferred milk vessel. Beyond environmental and economic reasons are psychological arguments. In The Atlantic’s “The Surprising History Of The Milk Carton,” Emily Chertoff argues in favor of the bag method, asserting that it provides a form of behavioral control. She posits that because the bags cannot be resealed after opening, you’re forced to drink the milk faster. In 2015, Golden Hills Elementary school in Nebraska introduced personal-sized bags of milk to school lunches, citing test results that indicated children were more likely to finish their milk when they could see how much was left in the clear plastic pouches. So why isn’t the U.S. more keen on them? Large manufacturers of plastic jugs and cartons certainly don’t want bagged milk encroaching on their market dominance. Even in Canada, there are politics at play. In 2013, a milk war broke out in Ontario when Mac’s Convenience Stores announced plans to make milk available in three-liter containers. The Dairy Farmers Of Ontario, which represents cow farmers, had concerns about what a new three-liter option would do to the sales of farmers’ four-liter bags. Meanwhile, the Ontario Dairy Council, representing the interests of the factories that process and package milk, wanted to give consumers the downsized option. In December 2014, Mac’s launched a pilot program for the three-liter jugs, but the Ontario Dairy Council argued to the Agriculture, Food And Rural Affairs Appeal Tribunal that this program gave an unfair advantage to certain retailers. Eventually, the ODC won, and regulations on milk packaging in Ontario were altered to allow for three-liter jugs across the board. Milk bags lost some of their dominance. No doubt, America would face a similar war with the introduction of milk bags. The U.S. milk industry is heavily regulated and controlled by giant milk companies. In 2003, when a man in Southern California started bottling his own milk and selling it for 20 cents less than the average gallon in his area, a powerful conglomerate of large milk companies and dairies spent $5 million to lobby Congress, successfully, to pass a bill strengthening price-control laws. Then there’s the matter of many large U.S. dairy companies, including Dean Foods Co., that produce their own jugs in-house; so much of the milk industry is intertwined with the jug industry. Plus, American consumers just don’t seem that open to changing their milk ways. Chertoff points out in The Atlantic’s history of the milk carton that it took two to three decades for the carton to catch on for American consumers, who held onto their precious glass bottles for as long as possible. Perhaps no food or beverage is more associated with habitual routines than milk, so even the smallest change in its packaging can be startling. It seems more likely that U.S. dairy companies will move toward more environmentally friendly jugs than throwing away the jug concept altogether. In fact, a Kroger’s dairy in Virginia just launched a new lightweight gallon jug that uses 10 percent less plastic than the old jugs, and more Kroger’s dairies are expected to do the same this year. It looks like milk bags won’t be normalized in the U.S. any time soon.